Norman Bethune was probably the most prominent Canadian volunteer in the Spanish Civil War. He is the subject of over a dozen biographies from which one can learn about his role in developing blood transfusion techniques during wartime. Most books regarding Bethune have raised questions but have provided little explanation regarding Bethune’s troublesome relationship with Spanish authorities, rumors about alcoholism and libertinage, and his withdrawal from the Canadian Blood Transfusion Service he created. David Letherbridge’s new biography does a remarkable job clarifying these issues. Bethune’s contributions to wartime medical services are legendary. He was in charge of the first mobile blood transfusion unit, a service that started modestly with headquarters in Madrid, but expanded into satellite units in Barcelona, Valencia, and Jaén. Bethune’s main contribution was the unit’s mobility. “He took the blood to the wounded,” and in doing so the Canadians were responsible for 80 percent of all blood transfusions during the war. Bethune arrived in Spain around the same time the first international volunteers did in November 1936, and upon his arrival started organizing the Canadian Blood Transfusion Service. Working side by side with Bethune was a group of Canadians and Celia Greenspan, the first known American woman volunteer. Propaganda was a major front in the Spanish Civil War, and Bethune understood this well. From EAQ, a radio station off Gran Vía, he broadcast to British and North American audiences. Some of the transcripts of his addresses are reproduced in this book, including other documents by Bethune, such as his pamphlet The Crime on the Road: Málaga-Almería. Letherbridge comments extensively on Heart of Spain, the documentary film that Bethune made and later used to publicize his work and raise awareness during his North American tour. Bethune’s assistance to the civilian population after the fall of Málaga was a life changing experience. For three days, he and his aides treated hundreds of people en route to Almería in the unit’s ambulance. They would not have survived otherwise. Surprisingly, Letherbridge covers this episode in one chapter, relying mostly on the pamphlet mentioned earlier. Bethune’s presence on the road to Málaga was due to test the transport blood supplies from Barcelona in their refrigerated truck, an experiment he aborted after the humanitarian crisis confronted him. Bethune solved the deficit in blood supplies during the battle of Jarama—when 700 wounded were brought to his hospital in the first five days—by extracting blood from the deceased. Cadaver blood transfusion was an experimental method he tried in desperation to save lives. 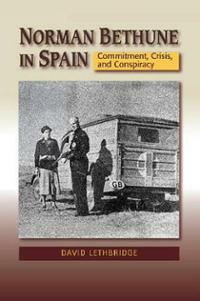 Letherbrige’s choice of the word “conspiracy” in the book’s subtitle refers to Bethune’s withdrawal from Spain. It seems quite possible that it was linked to a report sent by some of his collaborators to Canadian Communist Party officials informing them of his autocratic and selfish attitude toward his comrades. These slanderous accusations led to a police report on Bethune. He left Spain in May 1937. David Rodríguez-Solás is Visiting Assistant Professor of Spanish at Middlebury College. His most recent book is Teatros nacionales republicanos: la Segunda República y el teatro clásico español (Iberoamericana-Vervuert, 2014).